The Game Changer charity are working with Square Enix on a promotion that gives people a copy of Hitman: Absolution when they donate a minimum of $1.00 to the charity. If this sounds good, you can do it HERE. Be quick, because today is the last day. While Absolution might not be the best Hitman game, $1.00 is ridiculous value. The game still has its moments – a back-alley hit just out of sight of Chinese New Year revellers being a highlight. Going back, it’s impressive how well the game holds up graphically, too. If nothing else, it will undoubtedly get you excited fro the upcoming reboot. 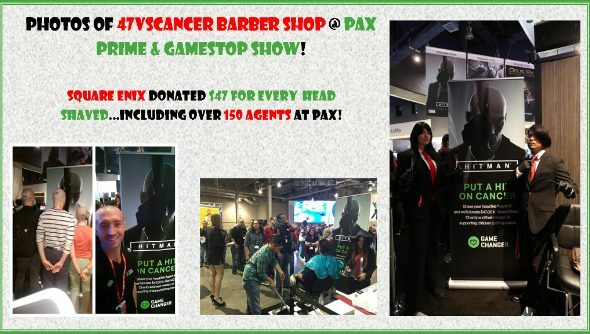 This particular charity drive has seen great success during PAX, with a Hitman barber shop stand set up at the show. For every head shaved, Square Enix donated $47.00 to Game Changer. It would be lovely if we could help give it one last push on its final day. All donations will be going towards the fight against pediatric cancer (or cancer in children). 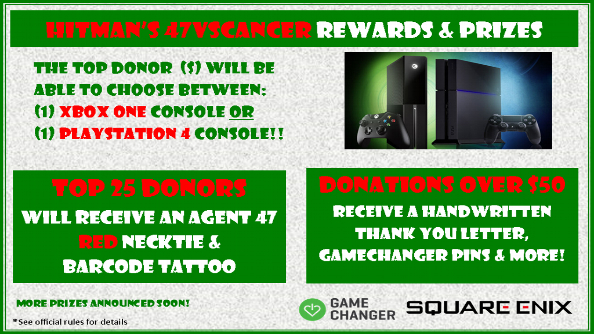 If that isn’t enough incentive for you, the person who donates the most money will be able to choose either a PlayStation 4 or Xbox One as a prize, while the top 25 donors will get Agent 47’s iconic tie and a barcode tattoo. Donations over $50 will get a handwritten “thank you” note from the charity. If you want to learn exactly where your money is going, the video below shows some of the great work the charity does. Even if you can’t donate, please consider spreading the news and you’ll receive some free paragon points.